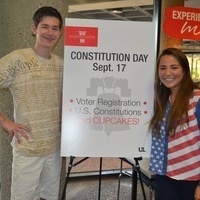 Enjoy free cupcakes and pocket-size U.S. Constitutions from the McConnell Center! Trivia and information about the signers of the Constitution will also be on display. As part of the McConnell Center's continuing mission to assist Kentucky citizens in developing a better understanding of the U.S. Constitution and American history, the McConnell Center is proud to sponsor UofL's celebration of Constitution Day.